NORTH CENTER — Indescribable! Indestructible! Nothing can stop it! The Blob! 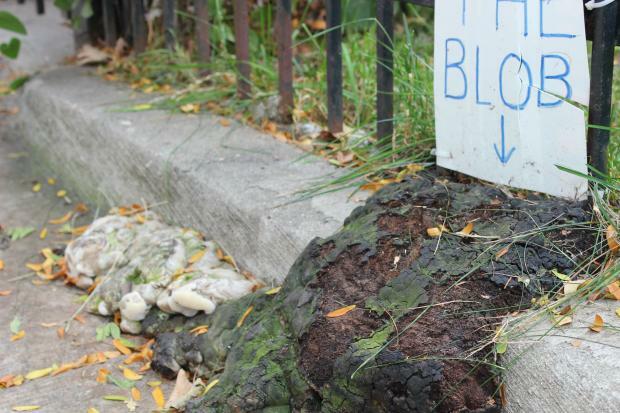 A mysterious substance started oozing from the ground in the North Center neighborhood 10-15 years ago, spilling out of Larry and Linda Bartoli's yard and massing into a mound on the sidewalk in front of their Montrose Avenue home. "I thought originally it was some kind of mushroom," said Larry Bartoli, who named the Blob after the 1958 movie about an amorphous creature from outer space. Despite its spongy, fungal appearance, a rap of the knuckles reveals the Blob to be rock hard. Hack away at it — curious passers-by are fond of sneaking samples — and the Blob grows back. "It comes out white, then it turns gray-ish, then green," said Bartoli, a retired Chicago police officer. Ever the investigator, Bartoli took a chunk of the Blob to the plant experts at Gethsemane Garden Center, but they were unable to identify the life form. "We don't really know what it is," he said. If this were a movie, here's where the government or Army would swoop in, bent on capturing or destroying the invader. But the Bartolis have simply opted to embrace the oddity of the Blob, attracting attention to it with signage, and even adding eyeballs at one point, which were stolen. Their best guess about the Blob's origins: It's the "ghost" of a mulberry tree that once stood on the same spot along their wrought-iron fence. "I loved that tree. It went all the way to the peak of the roof," said Linda Bartoli, pointing to the top of the couple's two-story Victorian, where they've lived for the last 20 years. Complaints from neighbors about the tree, which had grown fragile and begun shedding branches, attracted city inspectors, who told the Bartolis the mulberry had to go. "It was rotten," said Larry. "The inside of the tree was hollow." Linda was devastated by the diagnosis. "I threatened to chain myself to the tree. I was beside myself," she said. The day the buzz saws came, she shut herself up in her bedroom. "I couldn't watch," she said. Soon after, "up comes the Blob," Linda recalled. She's convinced it's the mulberry, sending a message from beyond the grave: "You tried to get rid of me, but you couldn't." The story doesn't end there. The Blob isn't the only uncanny communication the Bartolis have received from their trees. Just weeks ago, Linda was inside the house when she heard a thump. Larry had climbed the pine in the couple's back yard to give it a trim and fallen 25 feet to the ground. As he was being treated at the hospital for five cracked ribs, doctors discovered a previously undetected aneurysm, which they were able to neutralize. Said Linda, "If it wasn't for the tree, we never would have known."